Life is a dance. Between birth and death is the “dash!” Are you making the most of your dash? 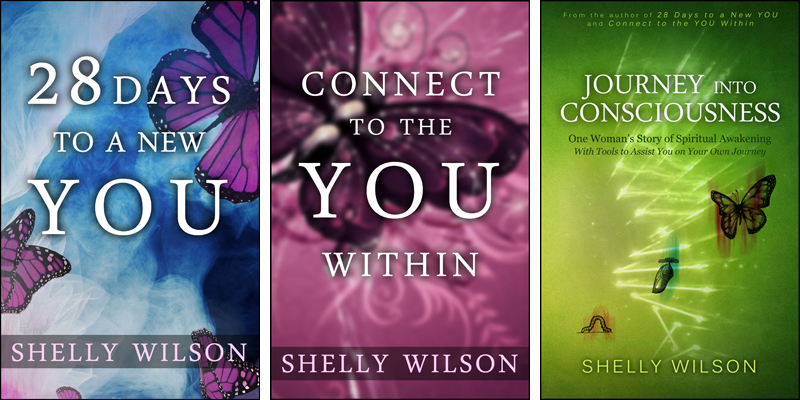 Are you dancing or are you a wallflower – observing others’ lives wishing they were your own? 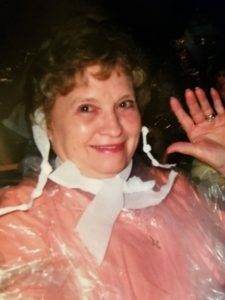 My beloved grandmother Juanita, known as Nanny, experienced a ruptured aneurysm on January 10 while partaking in one of her favorite pastimes (“feeding” the slots at a casino). I made the drive north to KU Medical Center in Kansas City and spent all night loving her, while watching her rapidly decline. With much heartfelt consideration and compassion, the difficult decision was made to allow the transition process. I said my goodbyes late Thursday morning and made the drive back home. 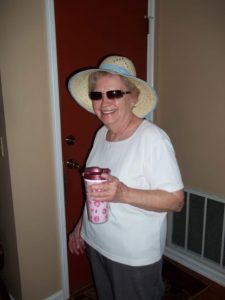 She passed at home shortly after midnight on January 15 in the loving presence of her children and several grandchildren. 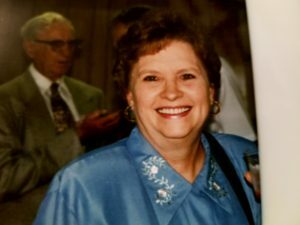 Her celebration of life was held on Thursday, January 18. 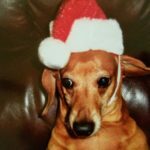 In addition, our sweet dachshund Odie made his transition on January 16. Nearly 16 years old, he was the oldest of our 7 fur babies. His presence in our home is deeply missed. Honoring the grieving process has been essential for me, and I keep reminding myself to focus on love. My beliefs are that life continues beyond this earthly form, so I know both Nanny and Odie have returned “home” and that their love for me continues as well. During this time, Matt Kahn’s book, Whatever Arises, Love That, has assisted me tremendously. The willingness to allow your choices to come from a place of love no matter the outcomes or circumstances at hand is what Matt refers to as the heart of surrender. This shift into heart-centered consciousness makes welcoming each moment with openness, kindness and compassion more vital than what you hope to gain from life. In the heart of surrender, your highest aspiration is to fulfill each goal in the most loving possible way. If there is an imbalance, it will be healed with love. If there is confusion, it will be clarified with love. If there is anything to choose, it will be chosen by love. If there is anything to awaken, it will be awakened by love. 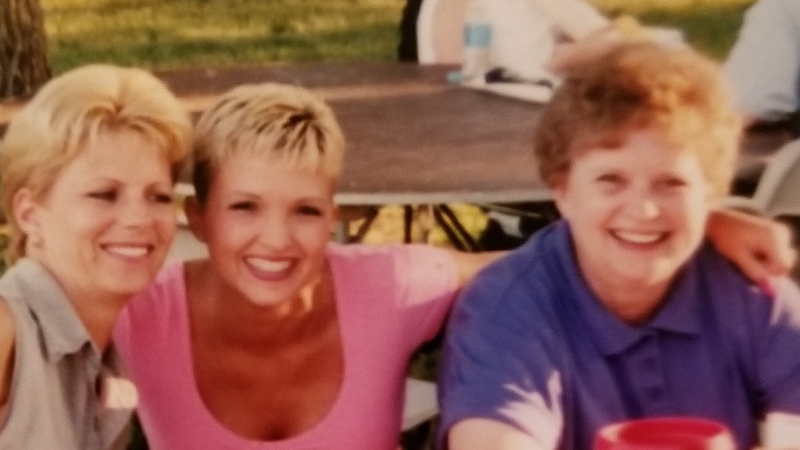 Provided with the opportunity, this is what I wrote and would have spoken at her celebration of life…. On behalf of the family, I would like to say “Thank you” to each one of you for joining us in this space to celebrate the life of Juanita DeMaranville. Regardless of how you knew her, whether it be as a mother, friend’s mother, grandmother, friend, co-worker or acquaintance, Juanita’s legacy is undeniable. Her kindness, compassion and regard for others is apparent. 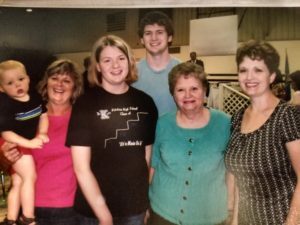 She loved and cherished her family, and it showed. She was so proud of each one of us, and she would tell us. Although, Juanita was vertically challenged, she was definitely mighty. 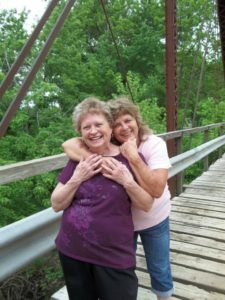 Juanita lived her life by The Golden Rule – Do unto others as you would have them do unto you. 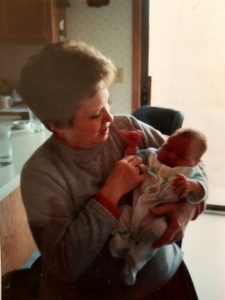 As the first-born grandchild, I had the honor of naming her…and so she became Nanny. I wanted to share just a few fond memories from my childhood and teenage years. Nanny took care of me shortly after I was born, so that my parents could work. 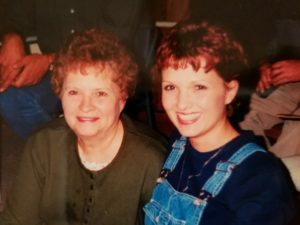 I know it was hard for my mom, but she also knew that I was in very good hands. Nanny and Pa’s home was in the country and had lots of space for the five children who still resided there. It had a basement AND an attic, and I got to explore both freely. Nanny would pack me a picnic lunch, and I could sit in the attic and eat it or sit on the stairway leading down to the basement. There was also a very scary wooden bridge that crossed Stranger Creek at the back of their property. As many of you know, it has since been removed. I remember walking down the gravelly dirt road with my aunt and uncles just to walk across it. Walking across the bridge was scary to me because there were huge gaps between the boards, and I could see the water below. With sheer panic, I would tremble and shake, taking one step at a time, gingerly placing my foot very carefully on each of those boards. Once I got to the other side, I would have to do it again to get back to their house. I also remember when Nanny worked at the motel here in town for a time. I got to help her clean, and it was so much fun. The owner paid me with a silver dollar. I truly treasured my time with her. At one time, Nanny bowled a lot….it seemed like that’s all she did, and she was good at it. I remember her singing and playing the piano. 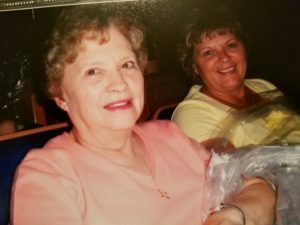 She loved to fish, and she loved to plug those slot machines. When my kids were young, we took a trip to Las Vegas with my mom and Nanny. I can still see Nanny decorated in paper waiting on The Blue Man Group to start their show. Although I didn’t get to see her as often as I could due to the geographic distance between us, I thought of her frequently and would call periodically. The last time we spoke was Dec 29 when I called to tell her about our experience shopping for our daughter Caitlin’s wedding dress. 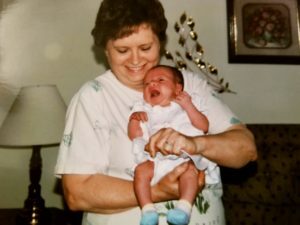 After receiving the call about Nanny’s dire health situation, I made the drive North to Kansas City and spent all night loving her, while watching her rapidly decline knowing what was inevitable. As I drove home and reflected, the lyrics from The Byrds song, “Turn, Turn, Turn (To Everything There is a Season)” based on the Book of Ecclesiastes from the Bible began to play in my mind. I know that Nanny would not want us to be sad for her passing. 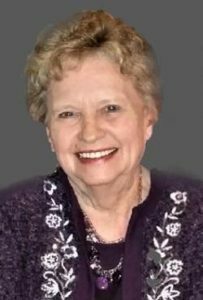 In the months and weeks prior, she frequently stated that she has lived a good life, she was tired and she was ready to go home….she was ready to be reunited with the love of her life, Jim, and her son, Vince. I invite you to honor her life by choosing to live a good life until you, too, are ready to return home. Even though I have shared a few of my personal memories, I recognize that each one of you will have your own special memories of Juanita. Her loving legacy will continue with each one of us when we choose love. In closing, I would like to offer you this verse from 1 Corinthians 13:4-7. Love is patient, love is kind. It does not envy, it does not boast, it is not proud. It is not rude, it is not self-seeking, it is not easily angered, and it keeps no record of wrongs. Love does not delight in evil but rejoices with the truth. It always protects, always trusts, always hopes, and always perseveres. Love never fails.